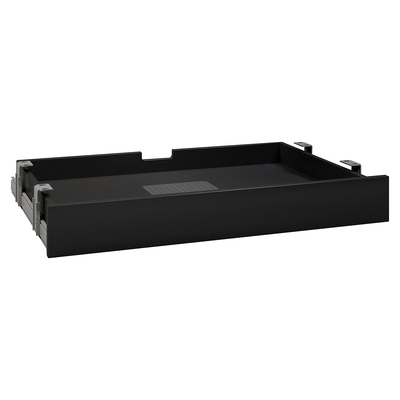 Can be used as a keyboard drawer, laptop docking station, or pencil drawer. Height-adjustable brackets. Ventilated bottom shelf allows air flow. Drop design drawer front acts as a wrist rest. Smooth and durable ball bearing drawer suspensions. Smooth and durable ball bearing drawer suspensions. For use on many BBF lines including Milano2, Quantum, Realize, 300 Series, Enterprise, Syndicate, Aspen Tables, Series A, and Series C.
Work your best with the Multi-purpose Drawer with Drop Front in a black finish for accessories that work. Our multi-function accessory drawer can be used as a keyboard drawer, laptop docking station, or pencil drawer. This design combines a drop drawer front panel for use as a wrist rest when using a keyboard. The ventilated bottom shelf allows for air flow and heat dissipation when used as a laptop drawer. Enjoy the smooth sliding action of our ball-bearing drawer slides built for durability and longevity. The Multi-purpose Drawer is a versatile accessory with a smart design that helps keep you organized. For use on many BBF Collections including Milano2, Quantum, 300 Series, Enterprise, Syndicate, Series A, Series C, and Aspen Tables. Customize your desk with quality accessories designed to improve your workplace.